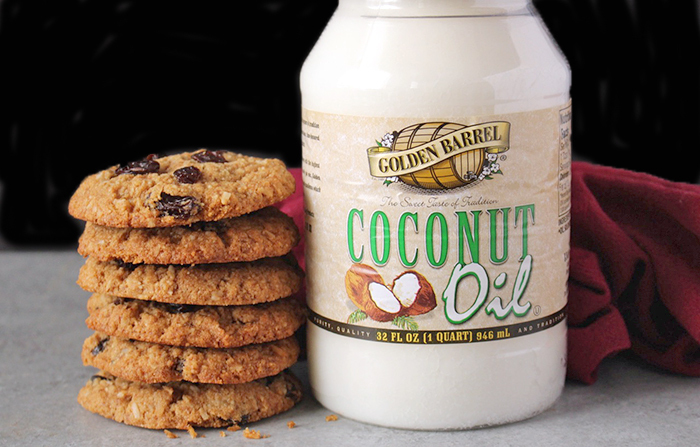 These Coconut Oil No Oatmeal Raisin Cookies have the same taste and texture as a traditional oatmeal cookie, but made grain free! Sweet, chewy, and so delicious! 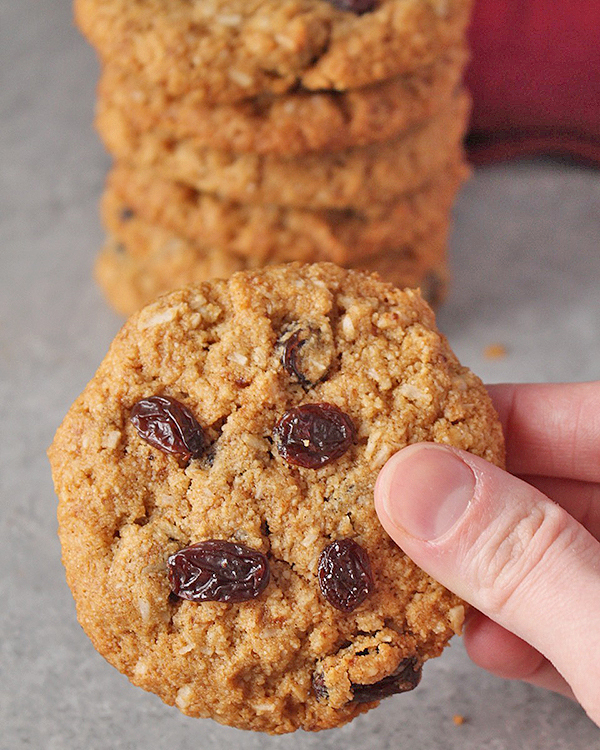 I have always loved oatmeal raisin cookies. 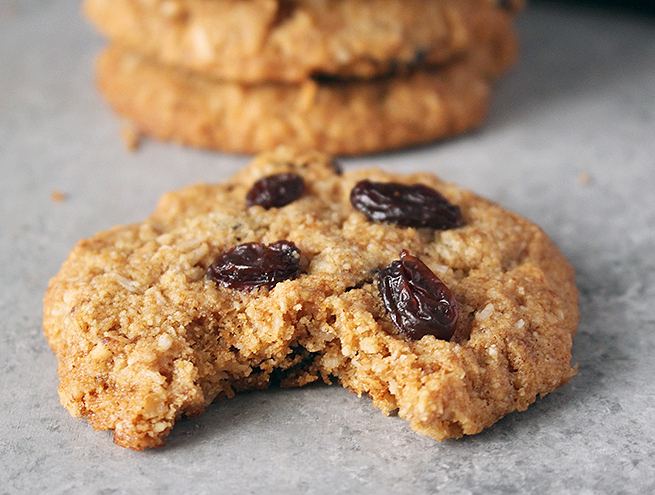 The chewy texture, the sweet raisins, and the subtle taste of cinnamon- the perfect cookie in my opinion. 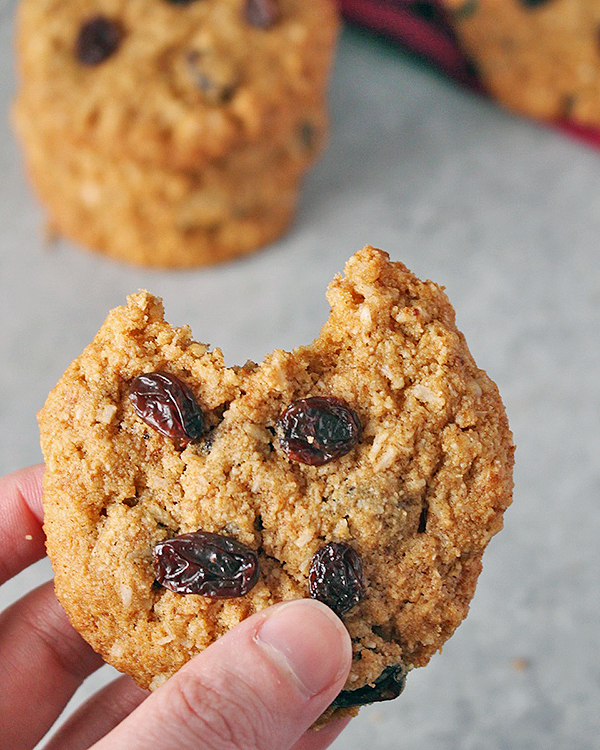 Unfortunately, oatmeal gives me a pretty bad stomach ache so I created these with coconut instead and it’s amazing how spot-on the texture is! 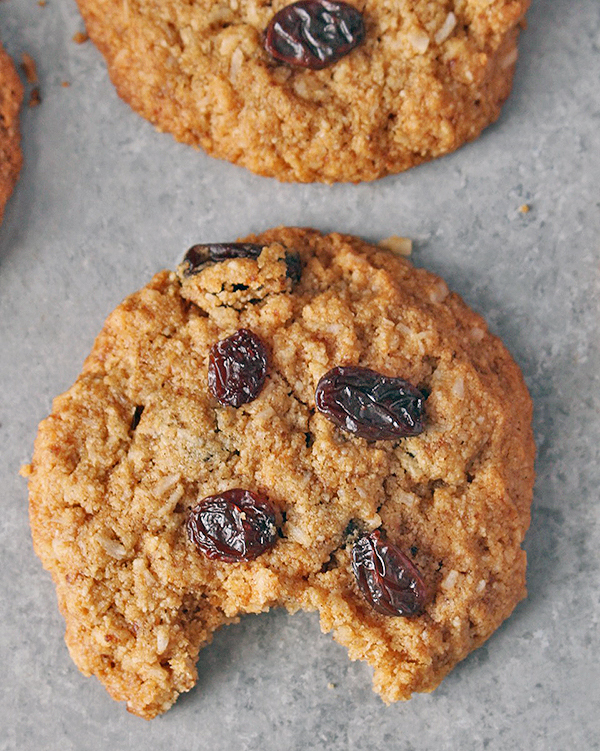 It even has that rough look of an oatmeal cookie. I thought they would be good, but I didn’t think they would be THIS good! 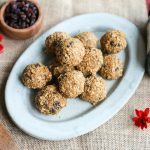 I didn’t just make these oat-less, I also made them dairy free by using coconut oil and refined sugar free by using coconut sugar. These are chewy and caramelized on the edges and so soft in the middle. 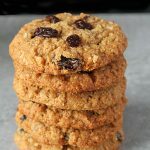 Eating one reminds me exactly of eating a traditional oatmeal cookie- they are that delicious! 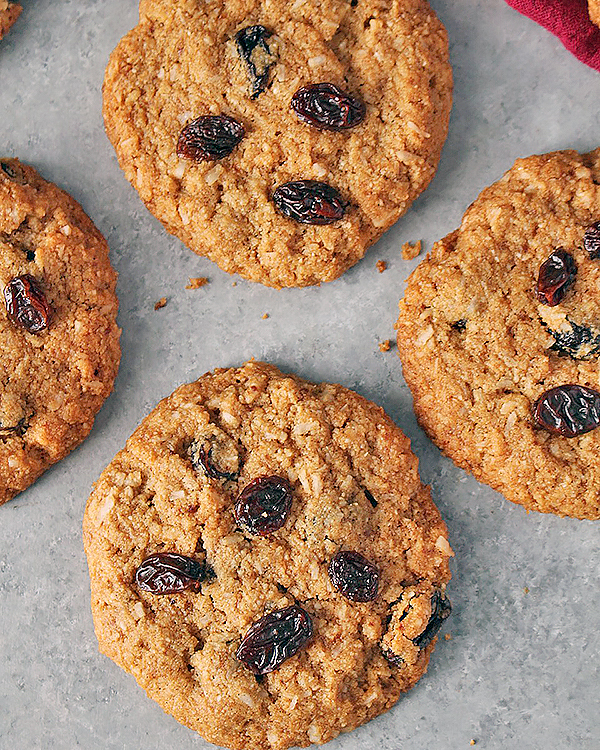 Now I am all about a chewy cookie and have been known to under bake them just to be sure they aren’t overdone. These are a little different though. It may seem like a long time to bake them, but you want to follow that or they won’t hold together. I learned this the hard way 🙂 If you like them crispy, feel free to add a couple minutes. They also need a few minutes to cool on the sheet tray because they will be too soft to handle right away. 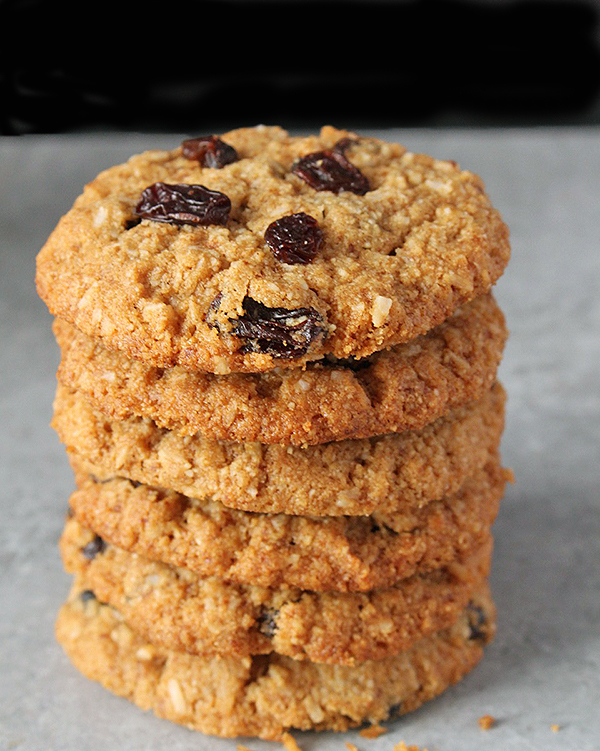 Okay, so for you raisin haters- I know you’re out there- yes, you can replace the raisins with chocolate chips. Or cranberries, or nuts, or really whatever your favorite add-in is. Nothing can take the place of a tasty plump raisin, but do as you wish! 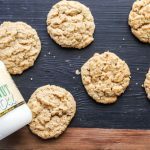 You will love these because they are super easy to make (no mixer required), delicious and grain free. Preheat the oven to 325° and line 2 sheet trays with parchment paper. Set aside. In a medium bowl, combine almond flour, shredded coconut, cinnamon, salt, and baking powder. Mix well. In a large bowl, combine coconut sugar and coconut oil until completely combined. Add the egg and vanilla and stir until smooth. Add the almond flour mixture to the sugar mixture and stir until fully mixed. Fold in the raisins. Scoop balls 1 heaping tablespoon big, roll them and place them on the sheet trays. It should make 16 cookies, so 8 per tray. Bake 1 tray at a time for 14-16 minutes, until the edges are brown. Let cool 5-10 minutes on the sheet tray before removing. My daughter is on the SCD. Can I sub baking soda for baking powder and honey for the coconut sugar? Hi Carol, yes to the baking soda, but I’m not sure about the honey. I think it would work but you’ll have to change the dry ingredients a little since honey will add moisture. You could try adding some more almond flour. I hope that helps you! Thsee cookies look soooo good. My hubby is allergic to Almonds and wheat flours. What flour can I use? Also cannot do egg yolks. Would just egg whites work? Thanks, Kathy! You can use a gluten free mix if you he can tolerate that. There is a chance cassava flour may work as well, I haven’t tried it but I know that converts pretty good usually and is affordable. I think egg whites would be fine- use 2 egg whites in place of the egg. Hope they come out good! Hi Claudia- I’m not sure, but you can use a site like My Fitness Pal to help figure it out. I hope you try them! Hi D- I don’t calculate the nutrition facts for my recipes, but you can use a website like My Fitness Pal to figure it out if you want. Hope you try them! Can you use coconut flour ? Hi Jamie- unfortunately that won’t work. 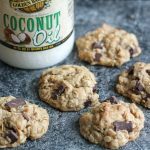 Coconut flour is very unique and can’t be converted 1:1. You could try cassava flour in place of the almond flour. That should work. Why dont my cookies spread out from the ball or should I press them down before baling? Hi Iris- I’m sorry they didn’t spread. I didn’t need to press them down, but if you do then go ahead. Thanks for trying my recipe! Hi! Just tried them and I will do another round. I think I over did it with the salt and they are really flat. I rolled them in a ball as instructed… do you think the salt had something to do with the flatness. Have no fear though, i will re-attempt tomorrow. You’re welcome, Jess! Thanks for trying them and for the great feedback! I just made your cookies and they are awesome. Mine did not spread out but I am fine with that. They are delish and I will be making them again. 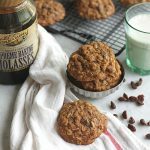 They are perfect for the Paleo way and will work on the rare occasion that I need a “dessert”…YUM!! !